There's a lot going on in this movie, as Layton announces with a stylistically frantic introduction. He opens with a painting by John James Audubon and a quotation from Charles Darwin, before asserting first that the movie is not based on a true story and then that it genuinely is one. Quick cuts and flashy upside-down shots lead to the claim that "these boys weren't criminals." Coming from an actual parent of one of them, the comment is the first clue that this sometimes-comic drama is laced with documentary. The story's central figures appear on screen as both fictionalized adolescents and — filmed years after the 2003-04 events — rueful real grownups. In a sense, the latter provide Layton's alibi. Perhaps the filmmaker doesn't have everything right, but even the participants can't entirely agree on what happened. Basically, it was this: Two childhood friends, melancholy Spencer (The Killing of a Sacred Deer's Barry Keoghan) and cocky Warren (Evan Peters), decide to rob Transylvania University's rare book collection. Spencer is an art student with much skill but little inspiration. Seeking a wild experience he thinks will give his art depth, Spencer is excited when he learns that his college has lightly guarded copies of Birds of America and On the Origin of Species that are worth millions. He sees that the treasures could be stolen easily. He doesn't get that fencing them would be a lot harder. Warren is fed up with his sports scholarship and the father who groomed him to get it. Far more aggressive than his friend, Warren becomes the primary impetus for the plot, even after the pals recruit two additional conspirators who also aren't thinking clearly about their futures: an accounting student who wants to join the FBI (Jared Abrahamson) and a gym rat from a wealthy family (Blake Jenner). Their alienation from upper-middle-class life is depicted less clearly than Spencer and Warren's. When the crime finally occurs, Layton switches styles yet again, filming the less-than-precision robbery with jittery handheld camera. But American Animals isn't exactly an action movie. The director borrows a gambit from Tarantino and Scorsese, punctuating the action with oldies that play as either exuberant or ironic. Yet Donovan and the Doors — let alone Leonard Cohen — can't turn the movie into a romp. In fact, much of the film is devoted to regrets and recriminations, and the principal act of violence — which doesn't lead to permanent injury — is presented as queasily disturbing. Unlike Hollywood gangsters, the four thieves don't shoot or knife anyone, yet they're stunned by the awfulness of their action. Almost as deflating as the ugly moment itself is the movie's epilogue. The young men's actual victim (impersonated in most of the film by Ann Dowd) offers a withering assessment of her attackers. Layton is known for The Imposter, a smart 2012 documentary about a European man who posed as a missing Texas boy. 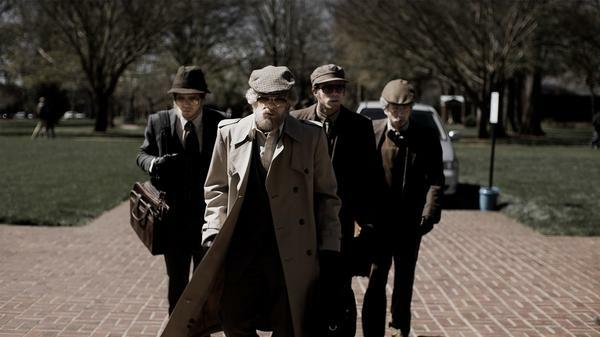 American Animals is also about charlatans, but the key moments are not the ones in which the boys try to hustle other people into accepting them as more worldly than they really are. When they imagine themselves as Goodfellas or Reservoir Dogs, the book thieves are really conning themselves.